Bartlett worked on the Manhattan Project with Robert Oppenheimer early in his career, then went on to spend six decades teaching at the University of Colorado in Boulder. We present this interview in observance of the anniversary of his death, September 7, 2013. 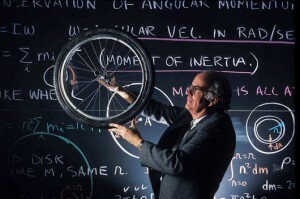 Bartlett was best known for his lecture on exponential growth, which he delivered nearly 2,000 times, around the world. The physicist campaigned tirelessly for honest acknowledgement of limits to growth – both globally and in his adopted hometown of Boulder, Colorado. Sit down with the professor for a lesson in sustainability. This interview was recorded in Al Bartlett’s office in the Fall of 2005. Thank you for that. To hear such an learned and sympathetic man give such views on the devastation that we are inflicting on our planet just reinforces my intentions to continue to speak out about the matter irrespective of the amount of criticism I will no doubt encounter. Thanks, Cheryl, for appreciating the Al Bartlett interview and his lifelong crusade for us all to appreciate the power of exponential growth. You may encounter criticism as you question the fundamental assumptions about how the world works, so many of us fail to examine closely. You will also encounter others, however, who have stopped to examine these. And they will thank you.